Wallpaper is great home décor option for adding some personality and color to your space, whether applied to walls or old furniture. Unfortunately, wallpaper earned a bad rep for its difficulty to remove from surfaces, after its soaring popularity during the 1960s and 1970s came to end. 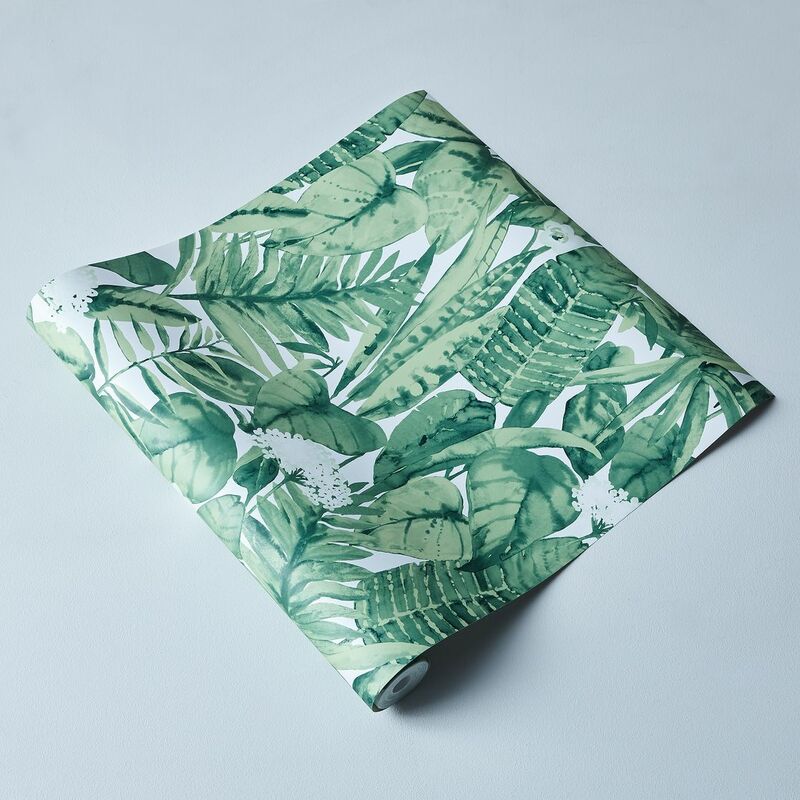 If you love the look of wallpaper but are concerned about the potential damage to your walls, we suggest giving this Self-Adhesive Tropical Jungle Wall Paper by Tempaper a try. Tempaper is a self-adhesive wallpaper company founded by two set designers based in New York. The line launched in 2008, stemming from the discovery that wallpaper was a frequent and easy solution to many decorative obstacles whilst working on set. Disappointed by the lack of options on the market, the two created their innovative and eco-friendly wallpaper line featuring unique designs and prints that will add charisma to any home. Their wallpaper products can be used on walls, dressers, headboards and book shelves to add color and charm to any home or office. The tropical jungle print features green foliage intertwined with soft floral accents reminiscent of a rain forest. One of spring/summer 2017’s biggest trends in both ready-to-wear fashion and home decor is luscious green color palettes and this retro-meets-modern leaf motif has a beachy feel, similar to the dreamy decor in the famous Beverly Hills Hotel. And while tropical prints can often give off a 1950s American kitsch vibe, this print’s water-colored appearance looks sophisticated and refined. This printed wallpaper can be removed easily from furniture and walls, leaving zero traces of sticky residue or lifted paint behind. Additionally, the application process is also fool-proof, due to its easy-to-use adhesive backing, making it a quick and easy alternative to indoor painting and perfect for walls, DIY projects and revamping old furniture items. Unlike most wallpaper products, Tempaper’s will also work in bathrooms and kitchens, as it will not be affected by moisture or damp conditions. Best of all, Tempaper provides products that are ethically-made and safe for your household. All products are made in the USA and do not contain lead, phthalate, or VOC toxins.